Let's go to Kansas they said. We'll find some marine reptiles they said. It'll be fun they said. Boy, were they wrong! Doing fieldwork in Kansas at the end of October is pretty rare for us, but we lucked out with the weather and spent a few days hitting outcrops we hadn't been on in a few years. It's important for them to go through an erosive "refresh cycle" so that we can find new stuff on the same ground. 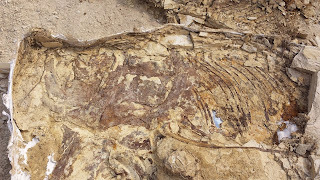 In just the first day we found the remains of a partial Pteranodon sternbergi and a few cool small fish. 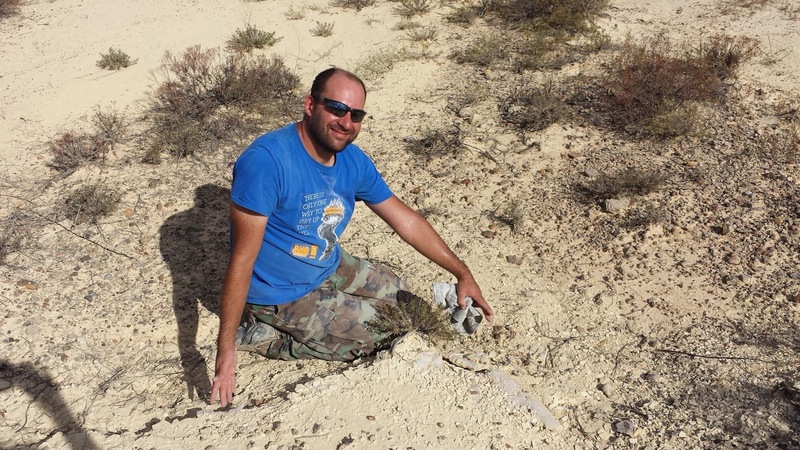 Mike and Jacob were working on excavating Pteranodon #6 of the year and I was finishing up jacketing a nice Ichthyodectes ctenodon specimen and had a little time to kill, so I wandered off to the south a little bit to scout for some cool treasures. I had been over the area just a few yeas before, so I was expecting something small. That's when I accidentally found the biggest fish of my career laying on its left side. I nicknamed it "Nia". 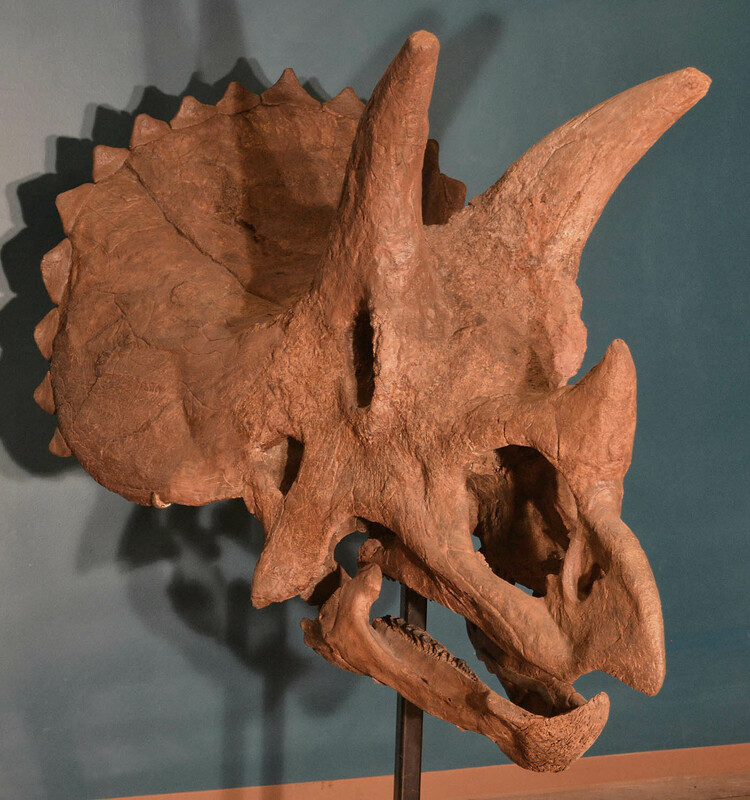 She's a Xiphactinus audax over 17 feet long when whole, with pectoral fins each 2 feet long. Luckily overburden wasn't a big problem at first, with an average of about 4 inches (100mm) of chalk over the specimen. 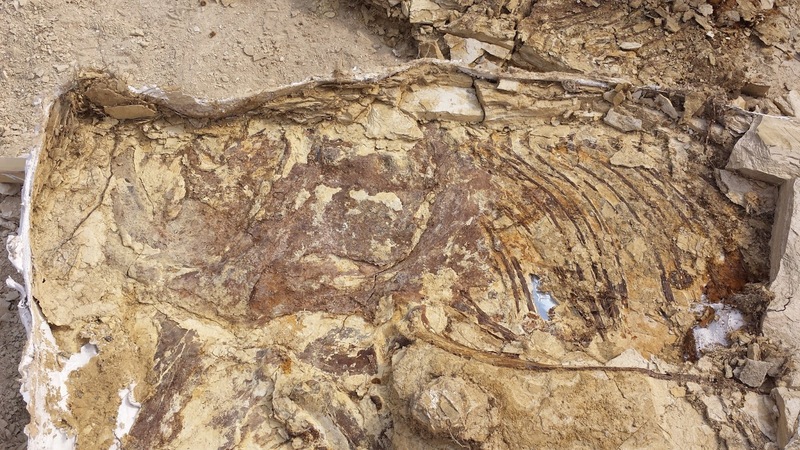 Digging in though, the articulated strand of ribs, spines and vertebrae were pointed straight into the outcrop wall. The Niobrara sea was chock full of predators ready and willing to scavenge a dead animal, and they didn't pay Nia any respect either. We discovered a half dozen shed Squalicorax falcatus teeth in the head area, lost while taking chunks of meat off the carcass. Unfortunately (or mercifully, depending on how you see it) the body was bitten off about 5 feet from the start of the dig. Jacketing was a bit tough and we anticipated some problems with a huge flat jacket in soft weathered chalk. 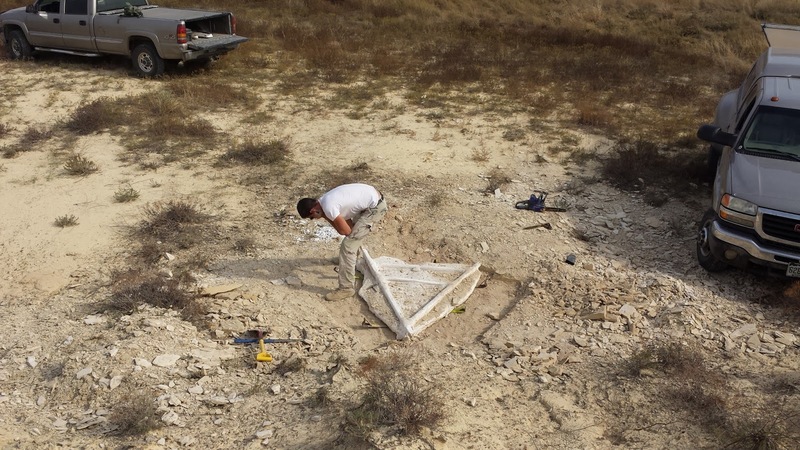 We feared a collapse (like that one other Xiphactinus I found a few years back that I nicknamed "Bea Arthur") so we did everything possible to try to get the specimen out safely. It still fell out, but to our amazement, almost all the bones remained in place in the jacket! Show prepping took a long time because of how soft the bones were. I got it into the "pretty enough" stage and now Nia is in storage, waiting for her turn to be turned into a spectacular panel mount.